Two pieces of history made tonight, as past giants Uruguay beat South Korea with some Luis Suarez brilliance despite a very weak second half, making the World Cup Quarter Finals for the first time since 1970. The second match crushed the American dreams as Ghana scored early in extra time through their best player, Asamoah Gyan, becoming the third African team in World Cup history to reach the quarters, and a first for the Black Stars. After a very strong first half, with Forlan, Cavani and Suarez dominating the South Koreans, in which Suarez scored a nice goal after a half shot half cross from Diego Forlan and the referee missed two penalties that should have been awarded to the Uruguayans, the tide turned, as Park Ji-Sung took over for South Korea, being everywhere on the pitch. Uruguay seemed to put its faith in their defence, which went through the group stage without conceding, but perfect records end sometime, and Lee Chung-Yong was the first to score against Lugano and his group. Diego Perez, who was excellent in the first three matches, just wasn’t there this time to hold the midfield. No worries – Forlan and Suarez took over, and Suarez’ brilliant goal paved the way for the celebrations. For the goals – go here. A game of momentum shifts and swings – and Ghana had one better. They outplayed the Americans in the first half, as Boateng took over the midfield with passion, scoring right after five minutes. Bradley threw in Feilhaber at half time and Maurice Edu even earlier for Ricardo Clark, and the Americans took over the game in the second half, testing Richard Kingson time after time, and only a penalty kick by Landon Donovan beat the man of the match. Ghana’s player seemed exhausted in the closing minutes, and got the full time whistle just in time. 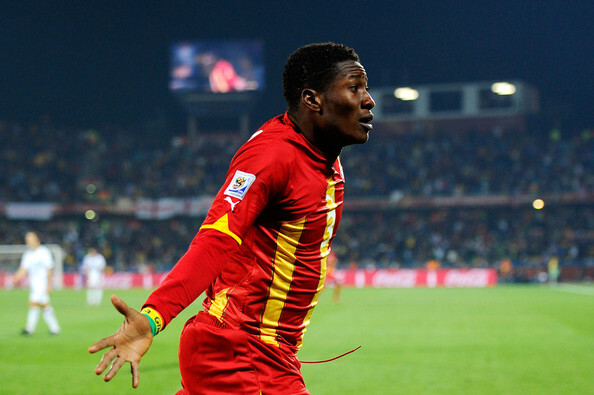 Asamoah Gyan struck with power three minutes after the extra time began, leaving Tim Howard no chance. The United States kept the pressure, but Kingson was ready for everything, and the USA’s most important player, Donovan, just couldn’t lift his performance to the level Bradley needed him to. 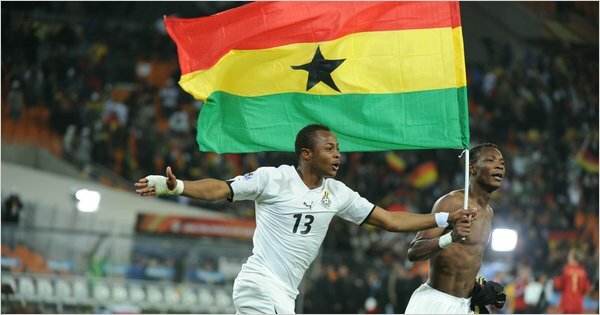 Ghana, rightfully so, are in the quarter final against Uruguay, still keeping the African flame lit in the 2010 World Cup. 1. Gonzalo Higuain (Argentina), Robert Vittek (Slovakia), David Villa (Spain), Luis Suarez (Uruguay), Asamoah Gyan (Ghana), Landon Donovan (United States) – 3 Goals. 2. Diego Forlan (Uruguay), Elano & Luis Fabiano (Brazil), Tiago (Portugal), David Villa (Spain), Lee Jung-Soo (South Korea), Kalu Uche (Nigeria), Brett Holman (Australia), Samuel Eto’o (Cameroon), Keisuke Honda (Japan), Lee Chung-Yong (South Korea) – 2 Goals. Mega Day – Kick off with Germany vs England – England are fully fit, while Germany are worried about Schweinsteiger’s fitness. The two have met four times before in the World Cups, and each game was tied after 90 minutes. England are full of belief after their 1-0 win over Slovenia, but it’s typical of the English team to get excited after a mediocre win, setting themselves up for disappointment. I feel that the midfield battle will decide this trench war of a game, and Bastian’s fitness is crucial for Germany in tomorrow’s match. Next is Argentina vs Mexico – A replay of the 2006 round of 16 match up, ending in a 2-1 win for Argentina after Maxi’s wonder goal in extra time. Mexico had one good game against France and a decent first half in the opener against South Africa. Not sure it’ll be enough against Argentina, who still don’t have Messi as his Barcelona self again.